812 Clark St., Evanston, 847-328-5525. Please call ahead for carryout. Open every day 11am-midnight. 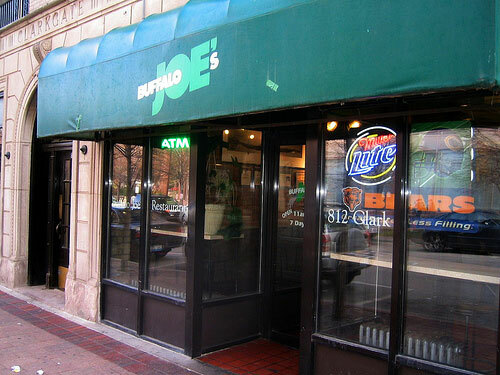 Tossed to order in Joe's sauce; they're served hot and buttery with chilled celery sticks and ranch. Mild, Spicy, Suicide or BBQ. A single pan of celery sticks with ranch cups. With single or double pans only! Don't like bones? TRY OUR TENDERS! 1/3 lb. of beef fresh from the butcher char-broiled and served with: mustard, pickles, ketchup, lettuce, tomato, and raw or grilled onions. Char-broiled with bacon, cheddar cheese, Joe's wing sauce, lettuce, tomato, and grilled onions. Char-broiled with bacon, cheddar cheese, BBQ sauce, lettuce, tomato, and grilled onions. Grilled onions, spicy or sweet peppers. Smothered with cheese - ask for grilled onions on top! 6 oz. Chicken breast served with lettuce, tomato, and mayo. Plain or sauced. Hand-breaded chicken breast served with lettuce, tomato, and mayo. Hand-breaded chicken breast tossed in Joe's wing sauce, served with cheddar cheese, lettuce, and tomato. Char-broiled chicken breast with cheddar cheese, bacon, Joe's wing sauce, lettuce tomato, and grilled onions. Served with mustard, relish, tomatoes, lettuce, raw onions, sport peppers and a dash of celery salt. The way they do it in Buffalo, NY! Served with all the trimmings and smothered with cheese. Served with mustard and grilled onions. Waffle-cut fries smothered in hot cheese. Hot cheese, hot sauce, and topped with hot jalapenos. Smothered in award wining chili and hot cheese! Tortilla chips served with chili, cheese, lettuce, tomatoes, sour cream, and sliced jalapenos. Any additional toppings are 79¢. Chili, cheese, sour cream, jalapeno peppers, and tortilla chips! Party portions are available, let us know how many you are serving and we will figure out the rest!